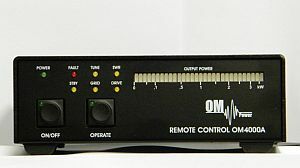 The OM-Power Amplifier OM2000+ works from 1,8 - 29 MHz, including the WARC bands. The Amplifier works also on 50 MHz. A FU-728F ceramic tetrode ensures a stable output power up to 2000W. The OM2000+ has 3 antenna outputs, which can easily be switched from the front panel. The operating parameters are displayed on a OLED display with 4x20 characters. In addition, a analog cross needle meter for the forward power and reflected power is installed. In addition, several LEDs indicate the operating status at a glance. For a simple adjustment to the operating frequency, there is a TUNE-Indicator, which indicates the correct tuning. Extensive protective circuits prevent damage to the OM2000+ event of incorrect operation. Critical parameters such as SWR too high, too high a grid or anode current, mismatch, etc. are constantly monitored. If an error occurs, the PA switches to standby. A temperature-controlled fan ensures the sufficient cooling of the FU-728F tetrode. If the tube should be changed, the voltage will calibrate automatically. A complicated trimming is not necessary. 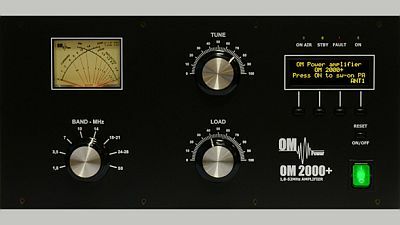 The OM2000+ is in this class with only 24kg, the lightest tube amp from commercial production. In addition, the OM2000+ works on 6m with full power. 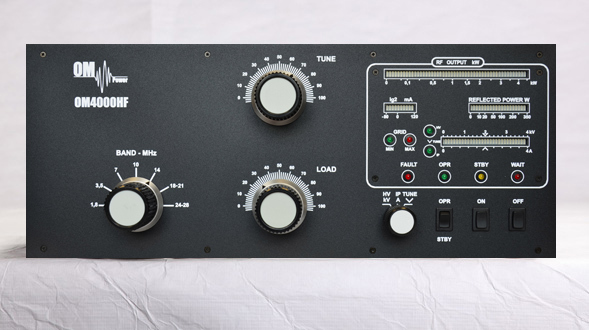 The linear amplifier OM2200A is designed for all short wave amateur bands from 1.8 till 29 MHz (including WARC – bands ) and all modes . It is equipped with a ceramic tetrode FU-728F. The OM2200A is automatically tuned to operating frequency of your TRX. 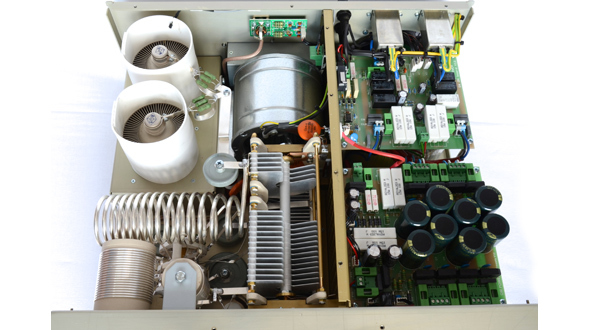 The Amplifier OM2500A has with the installed GU84B tube a output power up to 2500W. Optionally available is a remote control unit, which allows the amplifier can be operated remotely. Besides the automatic version is available with the OM2500HF a version with only manual tuning. 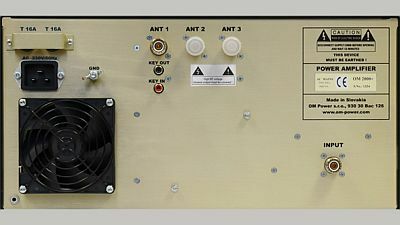 The amplifier OM4000HF provides two FU-728F tetrodes with a maximum output of 4000W on all HF bands. With such a high output power, high demands on the cable and the antenna are provided. However, should something go wrong, the amplifier can support up to 350W reflected power and then goes to stand by. Various other protection circuits ensure that the OM4000HF is not damaged on any errors.